Making time today for some very needed F. M. Q-ing! This one has been waiting a good couple of years, very patiently in the 'to-do' pile! I'm making time because this one has a very special (unbeknownst to them) recipient that has been waiting far too long! I'm not the greatest FMQ-er in the world but I'm enjoying the process and there's heaps of love going in to this one!!! What are you in the middle of today? Your FMQ-ing looks terrific. I wonder who the lucky recipient will be. your FMQing is much better than mine - it is something I do very little of - just doesn't hold any appeal for me. looking forward to seeing the finished quilt!! Looks wonderful to me! Lucky someone! I am in the middle of fussy cutting more LB blocks... Fun!!! What lovely colours and your fmq looks great, I think the recipient will think that it's worth the wait. Your quilt looks wonderful Wendy...nice quilting. 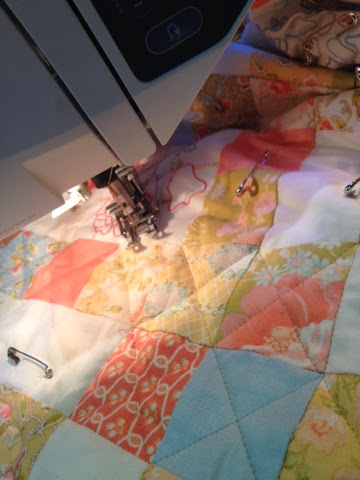 I am hand quilting a customer quilt right now. Looking great Wendy! Love that particular block in the last photo. You are a great FMQer Wendy, I can't get beyond making squiggles and hearts, but I try! What a blessing this will be and as of today, I only have 2 to complete that have been waiting! Hi Wendy, wow I think your FMQing is really lovely. 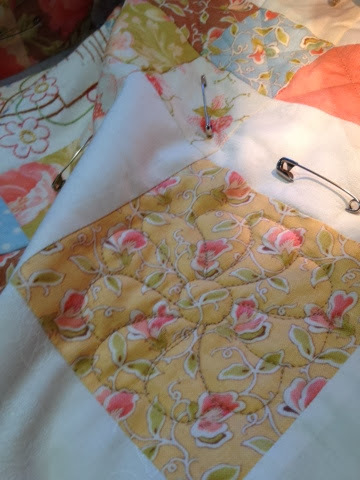 I am usually quite daunted doing my own quilting but have managed to do some over the years. The little flower design is really sweet. You are a brave soul - at least you are trying FMQ. Regardless, it looks beautiful. I think your recipient will be thrilled. I know I would be. My middle-day, dishes, dinner, grocery shopping, laundry . 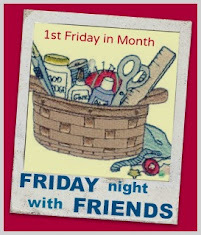 . . stitching had to wait for evening :) Have a lovely weekend.